Claim from Phil Jones and company: 'extreme temperature anomalies are warming faster than Earth's average' | Watts Up With That? From Indiana University and the University of East Anglia, this looks like another paper timed for release coinciding with COP20. What is even odder though, is the graphic provided with the press release, which shows global temperature anomaly for 1998, which was a super El Niño event year, the other odd thing is that the graphic (below right) is dated Nov 1tth, 2011. So it’s possible the press officer put it in and it isn’t part of the paper. I can’t tell since it is paywalled. I’ll purchase it, read it, and do a follow up report later. One thing I can say for certain: bias in Tmin due to encroachment by infrastructure causes a warm bias in the overnight temperatures, and thus the propensity for record lows is diminished in those stations which have been encroached upon in that way. That’s not anything to do with the posited AGW signal, but the simple physics of heat sinks. BLOOMINGTON, Ind. — It’s widely known that the Earth’s average temperature has been rising. But research by an Indiana University geographer and colleagues finds that spatial patterns of extreme temperature anomalies — readings well above or below the mean — are warming even faster than the overall average. The middle panel illustrates spatial patterns of temperature anomalies for April 1998. The top panel shows locations that are below the 25th percentile, and the bottom panel shows locations that are above the 75th percentile. And trends in extreme heat and cold are important, said Scott M. Robeson, professor of geography in the College of Arts and Sciences at IU Bloomington. They have an outsized impact on water supplies, agricultural productivity and other factors related to human health and well-being. Robeson is the lead author of the article “Trends in hemispheric warm and cold anomalies,” which will be published in the journal Geophysical Review Letters and is available online. Co-authors are Cort J. Willmott of the University of Delaware and Phil D. Jones of the University of East Anglia. The researchers analyzed temperature records for the years 1881 to 2013 from HadCRUT4, a widely used data set for land and sea locations compiled by the University of East Anglia and the U.K. Met Office. Using monthly average temperatures at points across the globe, they sorted them into “spatial percentiles,” which represent how unusual they are by their geographic size. Temperatures at the cold and warm “tails” of the spatial distribution — the 5th and 95th percentiles — increased more than the overall average Earth temperature. Over the 130-year record, cold anomalies increased more than warm anomalies, resulting in an overall narrowing of the range of Earth’s temperatures. The study records separate results for the Northern and Southern Hemispheres. Temperatures are considerably more volatile in the Northern Hemisphere, an expected result because there’s considerably less land mass in the South to add complexity to weather systems. The study also examined anomalies during the “pause” in global warming that scientists have observed since 1998. While a 16-year-period is too short a time to draw conclusions about trends, the researchers found that warming continued at most locations on the planet and during much of the year, but that warming was offset by strong cooling during winter months in the Northern Hemisphere. Co-author Jones of the University of East Anglia said the study provides scientists with better knowledge about what’s taking place with the Earth’s climate. “Improved understanding of the spatial patterns of change over the three periods studied are vital for understanding the causes of recent events,” he said. It may seem counterintuitive that global warming would be accompanied by colder winter weather at some locales. But Robeson said the observation aligns with theories about climate change, which hold that amplified warming in the Arctic region produces changes in the jet stream, which can result in extended periods of cold weather at some locations in the mid-northern latitudes. And while the rate of planetary warming has slowed in the past 16 years, it hasn’t stopped. The World Meteorological Organization announced this month that 2014 is on track to be one of the warmest, if not the warmest, years on record as measured by global average temperatures. In the U.S., the East has been unusually cold and snowy in recent years, but much of the West has been unusually warm and has experienced drought. And what happens here doesn’t necessarily reflect conditions on the rest of the planet. Robeson points out that the United States, including Alaska, makes up only 2 percent of the Earth’s surface. Using a spatial percentile approach, we explore the magnitude of temperature anomalies across the northern and southern hemispheres. Linear trends in spatial percentile series are estimated for 1881-2013, the most recent 30-year period (1984-2013), and 1998-2013. All spatial percentiles in both hemispheres show increases from 1881-2013, but warming occurred unevenly via modification of cold anomalies, producing a reduction in spatial dispersion. In the most recent 30-year period, trends also were consistently positive, with warm anomalies having much larger warming rates than those of cold anomalies in both hemispheres. This recent trend has largely reversed the decrease in spatial dispersion that occurred during the 20th century. While the period associated with the recent slowdown of global warming, 1998-2013, is too brief to estimate trends reliably, cooling was evident in NH warm and cold anomalies during January and February while other months in the NH continued to warm. December 9, 2014 in Climate News. When will they ever learn? Have Phil Jones studied Theories of Science? Might have, but definititly not understood what he studied. Have Phil Jones studied Mathematic Statistics? I doubt it. What have he studied before he became what he is? Could the last 30 years of the 130 years simply be demonstrating a reversion to the mean ? 🙂 Of course it can but that’s not the point. The point is that some calling themselves scholars act as if they haven’t passed 7th grade…. Or could the last 30 years have had the anomalies adjusted upwards more than the past? I suggest he return to the end of the previous warming period in the first third of the last millennium and re-read Francis Bacon. It is a long tome, but it discusses how to do science. Any time anything begins with “It’s widely known that ” you know that a bs storm follows. I do not care what the topic may be. I second Your suggestion. I am sorry not to have an extra example of Francis Bacon to offer to him. Does anyone else have? Yep. It’s a well-known fact. Lemme see if I have this correct !! So the cold extremes are warming faster than the average, and the hot extremes are warming faster than the average, and the average isn’t warming faster than the average. So it is all turning into a bath tub with a big (nearly) stationary dip in the middle. How does that happen ?? Only in a sauna built in the old fashion way described by arab geographers on route northeast todays Moskow back in 500’s…..
the Jumps though the hoops on that one….. It seems to me that the Arctic has warmed in the last decade or so, which implies that the rest of the world has cooled. I was under the impression that the Southern Hemisphere really hasn’t warmed at all, so there wasn’t anything to pause. Well, hang on. Isn’t that the only part of the year that is has been getting warmer in the first place? Then a pause in it is a pause in everything. There never was much ‘global warming’ in the first place, there was warming ‘on average’ caused (primarily) by NH winter warming. Now it stopped. Is this true or not true? Robeson is not lying, he is letting people, in their Gruberized stupidity, draw an incorrect conclusion (he hopes) from a truthful statement carefully constructed to give the impression it is ‘still warming’ elsewhere without actually saying it out loud. Go Team! Show us your morality! So if global warming is made up of four components (summer and winter in SH and NH), but a pause in only one causes a pause in the total, then either the other three were not warming and still are not, or any increases in one or more of the other three are balanced by decreases in one or more of the other three. Isn’t that how maths works? has Robeson and Willmott not realised Jones is toxic. The mere mention of his name on any paper is going to get it scrutinised. Fortunately 5 minutes scrutiny of this laughable effort is enough to see the appallingly poor science. At this point in time all science is toxic and needs extra scrutiny as too many useful idiots have infiltrated the erstwhile scientific institutions. Not the first time in history. Academia needs a giant purge. This purge will come when the Western standard of living is re-adjusted. Wait till they include current reality. Hahaha, that’s classic; I’ll have to remember that one! Record setting Antarctic Southern Ocean sea ice levels anyone??? I had to double take on that one as well. Presumably, if there’s no pause in Winter warming, meaning winters remain the same i.e cold, then logically, that would imply that there is no Climate Change either. I guess once you’ve shot yourself in foot, the only thing you can do next is shoot the other one. The bias is so obvious. It could just as well be we had unusual NH winter warming (+PDO?) for many years which has now returned to normal. But not a pause in Winter Warmer, I hope. There has been no pause in global warming, but there has been a pause in Northern Hemisphere winter warming. Hallelujah! We have saved winter/sarc. Someone should teach them simple addition. If global warming has not paused, it must mean that Northern Hemisphere winters are getting colder. But that is predominantly what global warming is all about. There is not much change in the SH since it is disproportionately dominated (controlled) by ocean that dampens resonse. If global warming is now going into the oceans there will be no significant still less serious global warming this century. As regards the NH, the night time lows are not quite as low as they have been and Winter comes later and lasts less long with Spring coming sooner. What is there not to like about that (especially with extended growing periods)? The fact is that daytimes highs are not getting significantly higher. The tropical regions of the planet are not becoming unhabitable. The Summer of 2003 which is oftened claimed to be the warmest summer in Europe with tens of thousands of deaths was only hot in southern/mid France; it was below average in Spain, Italy, Scandinavia, former Yugoslavia and Greece. when one analyses what is truly happening to temperatures, it is not a scary story. There can only be two scares to global warming. First sea level rise, but this will not be rapid so plenty of time to adapt. Second, it somehow causes more extreme weather, but there is no evidence that extreme weather is increasing; in fact it appears to be decreasing as one might expect if the poles warm so that the rtemperature differential between the equator and the poles is less. Climegate tells us about the quality of work and theintegrity of scientists plying their trade at the UEA, so that is probably all one needs to know to cast this study in the bin where it properly belonds. Sorry, but having my peach blossoms frozen in place for the past two years tells me that winter lasted longer than usual. The 2003 summer was also for a period unpleasantly hot in northern France and Germany. Weather, not climate. “Trivially true, but essentially meaningless.” (Dr Lindzen). But you are wrong to point to sea level rise as a “scare”. Levels will continue to rise until the end of the current interglacial. Onset of glaciation will cause sea levels to fall. At that point you are allowed to be scared. “Average temperatures don’t tell us everything we need to know about climate change,” he said. Yes. Especially since temperatures haven’t risen in some 18 years. Just how much goalpost-shifting, rules-changing, and excuse-generating does he think they can get away with? But goalpost-shifting, rules-changing, and excuse-generating are what the really, really, smart – ahem, educated – people do (all for the benefit of the great unwashed, of course)…just ask Dr. Gruber. The whole ‘climate change’ as a term is based on idea of goalpost-shifting. The climate is not warming enough, so lets claim it is changing /somehow/. They claim it’s changing somehow/someway/someday/you aren’t looking hard enough/you need to go back to the future/you need to be gruberized to see it/all this goalpost shifting is hard work so just bear with us while we think up something else. From 1881 to 1998 there really hasn’t been an acceleration in global warming. There’s been an acceleration in certain regions of the world. Rutgers University reports that the globe in 2014 had the highest fall snow extent in 47 years with just over 22 million square kilometers . Things sure seem to be warming up faster? Soon there will be no snow .? That is warm snow which is caused by global warming, as opposed to cold snow which as Dr Viner said has all disappeared. But it’s rotten snow. Right? “But Robeson said the observation aligns with theories about climate change, which hold that amplified warming in the Arctic region produces changes in the jet stream, which can result in extended periods of cold weather at some locations in the mid-northern latitudes. I’d never seen a climate change theory that mentioned southerly winter incursions of Arctic air, at least not until they occured in the last couple of years. An infinitely malleable theory that can give reasons, after the fact, for the bad weather that happened last year but can’t make any useful predictions even for next year. I am sure many people would have been very grateful for accurate predictions in 2010 of changed weather patterns coming in 2012-13. No, there’s been a pause in global warming, which cannot possibly be due solely to a pause in Northern Hemisphere winter warming. If everywhere else has continued to warm then at the very least the northern hemisphere winters must have gotten colder for the global average to remain constant. So they continue to lie. Actually, according to the GISS data, and the NCDC data, the much colder boreal winters are indeed the reason for an almost flat trend. There’s only been a rise, then a pause in the physically meaningless global average temperature. We don’t really know what’s happened globally, because we keep using this fantasy metric. I’m actually quite interested in the real story, which seems to be about the boreal winters. The drastic COOLING trend for large areas of the northern hemisphere, in winter, (which is obvious no matter what data you use), is the opposite of what global warming theory proposed would happen, due to rising greenhouse gases, and an enhanced greenhouse effect. That it is such a huge drop, so large it brings the global average down, it’s a real story. I’m sure these folks are way more educated than myself, but my intuition is that they are simply sensationalizing anomalies that can’t be positively associated with any single cause. It’s also troubling that satellite data was not also considered where available, as it is less prone to inaccuracy. Good point. Only yesterday I made the same complaint about a paper by Met Office scientists, incl Stott, which was paywalled in Nature. This may be of much value to climate researchers (such as many WUWT readers) who are not on academic library systems with journal access. The Nature Publishing Group (48 journals) has announced that all of their articles will be made available in a “free view” format (no copying, downloading, or printing, just read on the screen). Interesting step toward more open access while still trying to retain the paid subscription model for libraries, etc. Freely-accessible research can be presented in different ways via statistics, and only the correct presentation is acceptable. In the past 30 years, however, that pattern reversed, with warm anomalies increasing at a faster rate than cold anomalies. “Earth’s temperature was becoming more homogenous with time,” Robeson said, “but now it’s not. So global warming can first bring less extreme weather, and then more extreme! Even when for most of the last 30yrs there has been no warming at all!!! Why do they have to lie? Isn’t that statement a lie? I believe what is being said that – if we remove these cold temperatures from the average then [wow look at that] the average is warmer. Of course then the average ceases to be global so yes it is still somewhat distant from the truth. Using their logic, if we remove the warm temperatures, then the earth is cooling. Not at all; there hasn’t been a pause in global warming, there has been an end to global warming. They measured the 5% lowest and 5% highest anomalies in the grid used for Crutem4/HadSST3. They define that as their “extreme” anomalies. The distribution of a population can change markedly without affecting the average of the population. And that is what observe. I know what they were TRYING to say. What they DID say was ” spatial patterns warmed faster”. I was knocking their ability to write a clear sentence- Patterns cannot warm. Yes, definitely unfamiliar with how to use English… Note that it says “spatial patterns of extreme… are warming faster”… In that sentence, it is the spatial patterns that are ‘warming’… but how does a pattern have a temperature (that is an intrinsic property of an object…)? Sounds like a measure of UHI to me. Sounds like a measure of volcanoes to me. Funny how the most extreme “hotspots” “at the centre of gerbil worming” always seem to manifest on fault lines in the ocean. I’ve never heard this claim before. I almost found myself repeating it when I realised my only source is ‘some bloke on the Internet said’. The closest I’d heard to that claim before was that Antarctic heating hotspots are greates over volcanoes. Jo Nova has a couple of good articles on that. Can you give me a source for your claim? Why don’t they just go the whole hog and publish another “if you don’t stop producing CO2, aliens will come down from space” paper. I’m less than convinced by that graphic. Well it was reported recently that the first alien contacts will be machines, probably models. Fast forward to 2024. I wonder if they will still be saying the length of the pause at 26 years is too short of a time. At some point they have to get off that kick and face reality. No problem , the length of time required to support a claim is a product of how well the claim supports AGW. Just a thought. Did they even bother to normalize for the changes in geographic location and number of instruments? “Over the 130-year record, cold anomalies increased more than warm anomalies, resulting in an overall narrowing of the range of Earth’s temperatures. I’m not understanding that statement. 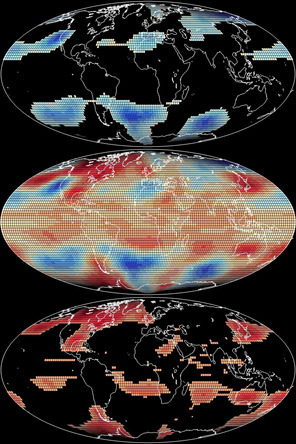 Narrowing of the range of Earth’s temperatures would happen if anomalies were LESS frequent. More anomalies in either direction, hot or cold, increase the range of Earth temperatures. Why would the direction of the anomalies affect the range of Earth’s temperatures? I had the same thought Steve and was about to point it out until I saw your comment. They didn’t say in the post but if the cold anomalies have not decreased while the warm have increased, that would increase the range rather than narrow it. I supposed I missed it, they failed to state it or they were too busy moving goalposts to think of it. Because these guys have very poor English. Dr Jones is poor at both English and Excel. Prof Lamb must be spinning fast. “- Over the 130-year record, cold anomalies increased more than warm anomalies, resulting in an overall narrowing of the range of Earth’s temperatures. The first bullet says that “cold anomalies increased”. Is that increased in number – there were more of them; or in severity – they were more extreme; or both? If they were all within the same temperature range as the lowest 5% over the first half of the period, or over any data available for the previous century, why would an increase in absolute numbers signify a problem? But if the issue is severity, wouldn’t that mean that the range of Earth’s temperatures has been getting wider rather than narrower? Similarly with the warm anomalies in the past 30 years – were there more but all within the established 5% range, or were there more above it than previously observed? If the latter, what steps were taken to analyse whether particular anomalies were not attributable purely to meteorological conditions? The comment from Prof Robeson that “temperature was becoming more homogenous (sic) with time” is possibly an inadvertent insight into what needed to be done to the data to get this result (“It’s milk, Jim, but not as we know it”). He presumably meant more homogeneous, but why would anyone be expecting to see that, or be surprised if an apparent trend towards it was discontinued? Don’t sweat this one too much. Dr Jones’ brain cell has overheated. Needs time in the ice box, next to the milk. Are you not embarrassed, Dr Jones? One way of making sense of this is that the increase in cold anomalies refers to their temperature. So, if the temperature of cold anomalies was higher than previously, it would make them less anomalous. You have to love any “academic” or “scientific” sentence that begins with “It may seem counterintuitive” because what almost always follows is ridiculous. And these idiots did not disappoint. Any academic area can be degraded by selection bias, in this case super El Nino events without fair evaluation of all cycles and cycle lengths involved. May day …may day… Forget about AGW… it is already as good as dead…but let’s try and keep it in life support for as long as possible….focus on saving and boosting the also in danger Gw…without it AGW perishes by default. Let’s make some more time for the also dying Gw and cross the fingers (some praying may be good too)..
Let’s start playing some new acrobatics and spin so as to keep claiming a Gw for the next half century regardless if there be a cooling leading to the death of Gw….. If any one wondering the above seems to be the last message of P.Jones and his mates to the die hards and the rest….when looking at papers like the one mentioned in this blog post. Seems like the whole AGW lot verey very desperate….including their high prists. Phil Jones and company are using a fractional biased analysis where the goal of the analysis is to find data to support the extreme AGW as oppose to solving a puzzle. That analysis methodology is ineffective if there are one or more fundamental errors in the base science. Fractional analysis enables one to ignore paradoxes. Biased analysis means there is a mental barrier, a group think barrier (those in the group do not want to be called a ‘denier’), to even consider competing hypotheses and to discuss the anomalies and paradoxes that disprove the group favorite paradigm. The climate change puzzle (what causes the Ice Epochs, what caused/causes the peculiar glacial/interglacial cycle in the current ice epoch 41 thousand year period (1.8 million to 800 thousand years ago) to a 100 thousand year period 800 thousand years ago to present, what causes abrupt climate change that terminates and initiates interglacial periods, why the interglacial periods are roughly 10,000 years in duration, what causes the 1500 year Dansgaard-Oeschger warming/cooling cycles, what causes the 8000 to 10,000 years abrupt Heinrich cooling events, and so on) is difficult to solve as it appears the cause of the changes is the sun. The twist to solving the problem is it appears the sun causes the past observations by changing in a manner that has not been directly observed before. The solar cycles in conjunction with the Milankovitch cycles are the keys to the Earth’s climate in its current ocean-landmass configuration and distribution. -Antarctica at the Southern pole. -The closing of the Panama current connection between Pacific and Atlantic basins. The Milankovitch insolation theory is not correct. Insolation changes at 65 N are not the cause of the glacial/interglacial cycle. The cause of the glacial/interglacial cycle is what causes Heinrich events. The confusion is the orbital configuration at the time of the very special solar change that cause the Heinrich event amplifies or inhibits the mechanism. Heinrich events occur with a periodicity of 8000 to 10,000 years. The last Heinrich event was the 8200 year ago cooling event. The coldest 5% of the anomalies increased in temp, that is, they became positive. If all else stayed the same, the range of the temps would decrease. Short of like if your feet got a little higher and all else stayed the same you would be shorter. Just reading through the comments, this paper has already been decimated on many points. Climate papers like these do not require proof beyond reasonable doubt, do not require preponderance of the evidence when evidence is conflicting, it does not even require probable cause. It just requires beating the climate change drums like savages in a primitive ritual. 2- Colder winters are now offsetting summer warming, thus distorting the measured(?) global average temperature. This seems to be an admission that “global average temperature” is NOT a valid metric! Does Jones really mean that? “Above or below” and then only the word “warming”, “cooling was omitted completely”. Obvious bias here and the papers scientific value is zero because of it. Well right now the extremes of Temperature (“hot and cold”) on earth are at least 120 deg. C apart, and every Temperature in that range can be found somewhere on earth’s surface right now. In fact there are an infinite number of places on the earth that currently have a Temperature (every Temperature) in that entire range. So just which extremes of Temperature are they worried about ?? That’s Phil Jones and his UEA pals. When you take an average of anything, won’t some parts be above average and some parts below? Well not if everything is the same all the time, like Kevin Trenberth’s earth energy budget says it is. This smells like a goal post move to avoid the pause, via the claim that it is the tails of the distribution that are warming even though the central tendancy is not. But the temperature distribution tails are the most impacted by homogenization which demonstrably cools the past and warms the present. In addition to the growing station siting problem impact on Tmin, this is exactly what the homogenization bias should produce. For the bias demonstration, see essay When Data Isn’t in Blowing Smoke. What I can’t figure out is why anyone would pay any attention to what this guy says about climate? He has not a shred of credibility as a person or scientist. It went out the window with “awful emails”, suppression of data for those that wished to reproduce the UEACRU results when after fighting to prevent it’s release for years they suddenly “lost” the original data when it’s release could be delayed no more. How Jones still has a job is beyond me? He still has a job because at the University of Easy Access (UEA) anything goes including extreme data molestation. The place is full of molesters. Hasn’t the data already cried ‘enough’? This continual reinvention of ways to manipulate and torture plain ole data is beyond belief. They’ve already killed it – can’t they just leave it to rest in peace? Its been dead for some time but that doesn’t stop them molesting it. Besides the fact that after Climate gate Jones should have zero credibility I find these sorts of discussions actually miss the point. Whether the world is warmer, cooler , more extreme or less extreme warmists seem to fail to link more CO2 to climate changes. There is no attempt to show why more CO2 causes cold and hot extremes.By urging us to take action to reduce emissions if we are suffering both hot and cold extremes a reduction in temperature will make cold extremes even colder. As more people die from extreme cold than extreme heat is this what we really want. The warmist think that if somehow they can manipulate the data and facts and interpret them to show these extremes it somehow helps prove their case. They end up just making it up as they go and a gullible press laps it up. It’s like the climate change placebo effect. By suggesting it might be happening is enough to make people think it happening. Any normal persons instincts will tell you it’s not and anyone who is more than 50 years old and isn’t reliant on the internet as a substitute for memory and recollection know intuitively that the climate has not changed in that time. To quote Jonathan David Carson: It used to strike me as impossible for global warming to cause cold weather. Then I realized that I could chill a soft drink in the oven if there were no room left in the refrigerator to bake a cake. Up until then I did not know that the same cause can have opposite effects. In my unenlightened state, it never occurred to me that carbon dioxide could cause both excessive heat and excessive cold, both drought and flood. I should have known. After all, we calm hyperactive children with stimulants and cure addiction to drugs with addicting drugs. When the government goes too far in debt, it borrows more money. We achieve diversity through uniformity. We overcome racism with racism. When children don’t learn, we send them to schools that don’t teach. We question authority by believing the authorities. We tell the truth with lies and lie with the truth. That may be the best comment ever, ever made on WUWT. Wow, Phil Jones is still at it? I thought he resigned. Reading an article by him is a little like reading an article by Rolling Stone, wouldn’t you say? Unlike most commentators here I really don’t think you can critique until you’ve read the paper – I can’t tell want was actually done of what the stated results actually mean from the abstract of the PR. I can see one thing curious from the Supplementary Info – the locations of the 5% & 95% percentiles are extremely highly spatially correlated. Why do you think people are critiquing the paper. I have no interest in the paper. The whole idea of man having any idea of how to manage the climate to his liking is totally inane. Also insane. But that’s the whole point HAS. They produce the abstract for P.R. to the masses, knowing that’s all 97% of it’s citizens will see. So It’s the P.R. of the abstract that needs to be critiqued for the 97%. The CAGW proponents have never had any intention of debating the actual science. It’s all about the proper P.R. to reach their goal of Co2 reduction. It doesn’t matter if the reduction of Co2 will provide any benefit. IMO Phil Jones has summarized the hockey-stick nearly. 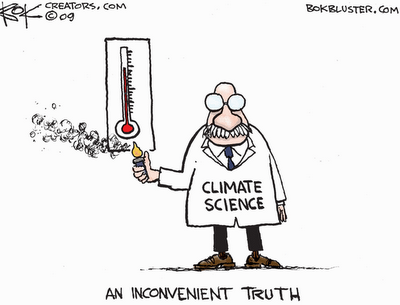 The second quote already had a fitting cartoon for it https://wattsupwiththat.files.wordpress.com/2011/08/cartoon_climate_science.png. ‘While a 16-year-period is too short a time to draw conclusions about trends, the researchers found that warming continued at most locations on the planet and during much of the year, but that warming was offset by strong cooling during winter months in the Northern Hemisphere. Once again as if by ‘magic’ the warming should have occurred, according to the BS Phil and the Team push out, has been perfectly balanced out by cooling form a mystery source which cannot be fully explained. Life is so much easer when you can use heads I win , tails you lose . But does this mean that Phil Jones has learnt some stats or even how to use Excel , or are we once again looking at ‘the dog eat my data ‘ approch ? And I wonder if people ask for the data they used to support their claims , they will once again be turned down on the grounds of ‘you only want to find something wrong with it ‘ which oddly is exactly the idea behind critical review which is supposed to be one of the foundations stones of science. Surely changing ocean currents mean that the NH and SH (land) differ much more widely than the maximum of 0.3°C that has been observed. Now the weirdos* think that that global warming will make this difference huge? *Apparently ‘warmist’ is snarky so I’m using ‘weirdo’ instead, as in ‘climate weirding’. Doesn’t “spatial” refer to geographic areas? Then this is saying both equatorial and polar regions warmed more than the temperate zones. Has there been an increase in equatorial temperatures over the last 130 years? But wait: ” — the 5th and 95th percentiles — ” must be referring to temperatures. For the overall average to increase less than the cold and warm anomalies increased in temperature, the less cold cold anomalies must have become more frequent while the warmer warm anomalies became less frequent, otherwise they would have raised the average commensurately. But wait: Isn’t it normal for an average to vary less than the extremes? I doubt if they know what they are saying, or if they are saying anything at all. If they mean cold anomalies became less cold to a greater degree than warm anomalies became warmer, then this is the actual mild global warming that has been observed over the full 130 year record. Nothing for them to be complaining about. Clearly, this time period was chosen to include the warming period of the late 20th century. If they were to address anomalies of this century, wouldn’t they have to say cold anomalies equal, or perhaps outweigh warm anomalies? Is there anything worth reporting in this study? It is entirely possible to have global warming simultaneously with Northern Hemisphere cooling, It all depends on what and where measurements are being taken and their weighting. The problem the warmers are having is that they weighted the northernmost regions too high, since they have started cooling. Of course they will fix that problem by adjusting the weighting to produce more warming. That is why we keep seeing adjustments going back to the 1800’s. Jones has decided that now is a good time to come out of hiding again. He got himself interviewed by the envir-rabid BBC the other day. It is meaningless what matters is what is going to happen going forward which will be a trend toward lower global temperatures in response to prolonged minimum solar conditions. “There really hasn’t been a pause in global warming,” Robeson said. “There’s been a pause in Northern Hemisphere winter warming.” For me this says it all. Just playing with statistics – make the statistics tell you what you want to hear. I haven’t read any other comments – sorry if others have said this. My neighbor says; “Figures can lie, liars can figure. Nothing odd at all when you just consider that it’s all BS from known BS artists. How much, I wonder, of the data examined was measured directly, as opposed to krigged/guestimated ? You know, I don’t know how much you upload the graphics in the paper (copyright issues?) but some the figs are beautiful, esp the last three. Really nice way to present complicated data. From what I can tell, Robeson did a sabbatical in Jones Lab, and this is what he did when he was there. I was surprised to see that Jones is on a US grant. It is interesting because I think it is pretty rare for the US to fund stuff in the in UK, you need to be really good. For those of you dissing the paper on “1st principles” before reading, it’s a nice read. They went through a huge amt of data, and their presentation all that work is simple and elegant. Did Phil Jones do all the Excel work himself? Paper in public domain, and data archived for all to see? You try to get a paper into the best journal, you idiot, not one with public assess. If it’s funded by NIH or NSF, it eventually becomes public, just not right away. But if they do that someone may try to find something wrong with it , and Phil cannot have yet and given his dog is ona diet he cannot go down the ‘dog eat my data ‘ route either . What’s the weather like over in the USA from North Dakota to Maine? Piers Corbyn forecast the present conditions nearly a month ago. Most dangerous 5 days of snow and storms in 100 years, warns astrophysicist. Jingle treads jingle treads laughing all the way,,, sorry couldn’t help it. As things are today with all the BS coming from Peru, I think I am going to shut down reading , listening and following all this bs until after Christmas, it is starting to be really be a downer and most of us do not need it. The insane rhetoric from the warmists is unbelievable. Calling Australia, Canada, the USA the worst countries regarding our records as far as environmental issues is appalling and coming from this UN so called “leader” is totally irresponsible and then to turn around and asking us for more funding is so maddening I need to take a break, so MERRY CHRISTMAS and A HAPPY NEW YEAR and thanks AW for this sane site! I would not believe Phil Jones on anything even after triple verification. You only lose your integrity once per life. +10, but then think about Clinton! The World Meteorological Organization announced this month that 2014 is on track to be one of the warmest, if not the warmest, years on record as measured by global average temperatures. Lying liars dressed up as climatologists. My studies have shown that Anthropogenic Global Warming directly causes serious anomalies in goal post stability. Something has to be done. This is beginning to look just like the solar search. Slice and dice the data enough and you can get it to do and say anything you want, including make your coffee in the morning and tuck you in bed at night. Sweating bullets and burning the midnight oil to tease out the only data trend you are motivated by grant money to find is exactly one of the major bias causes of type 1 errors in research. A false positive result, which I think invades the conclusion of this research, has led many a scientist down the primrose path. What is troubling is that this time, entire nations are being led down that path. This is no slice and dice. It is simple the top and bottom 5%. Grow up. Irony: the name-calling child telling the adult to “grow up” – while having no understanding of the meaning of that phrase. I’ve reached the conclusion that Phil Jones et al are using rectal thermometers, and pulling these anomalies from a fundamental source. I don’t think so. A rectal thermometer can measure to 1/10th of a degree Fahrenheit. The temperatures that they measures are probably to the nearest degree. However, a bigger problem is that they don’t know the sensitivity of their measurements with respect to the location of the thermometer – how much would it change if you moved it to locations 10 yards away, 100 yards away, 1 mile away, 10 miles away etc. Well Dr. James Hansen says you can move the thermometer 1200 km away and get the same reading. I can see how that would work if you were actually using the rectal thermometer for its intended purpose. Well it’s warming, if you disregard that cooling caused by the warming. that clears it up. Using a reflective surface technique I examined my navel and found that it has over the years become surrounded by an increasing amount of non abdominal muscular tissue and the ‘six pack’ of my twenties has become a ’20 litre tub’ in my sixties. A statistical association with atmospheric CO2 levels since the mid seventies gives a 97% confidence level and strongly suggestive of a causal relationship. It may in part be due to the CO2 in all that beer I drank back in the day being statistically associated with my abdominal deformation and then directly associated with and a contributor to CO2 pollution. A paper has been submitted to a bunch of my old mates from university for peer review and the latest stable mate magazine ‘Nature Narcissism’ advise they hope to publish in the new year. I am seeking funding for a follow up study which will focus on the effect of red wine in a post beer stage of life as a potential bio-engineering remedy to abdominal deformation. I would suggest to have your old university mates meet at the pub to review the paper. That way they could confirm the research through observation. Excellent suggestion. A true ‘team’ approach. I believe funding can be readily obtained for such an innovative collaborative methodology. Do they think that everyone who reads their releases is mathematically challenged and doesn’t know the difference between year to year noise and a statistically significant trend? Science with that kind of bias can’t be science at all! Consider a standing wave that circles the Earth about every ~60 years. The wave influences the jet streams and gives them kind of a default position. 1) Every 30 years or so this leads to more cold Arctic air flowing over the land surfaces of the US/Canada and Russia. 2) At the other extreme the wave pushes more Arctic Air over the north Pacific and Atlantic. When the cold air is pushed down primarily over land surfaces it leads to more cooling of the NH. The land is much more influenced by these incursions. When the cold air flows over oceans surfaces it is quickly warmed. In addition, when the cold air is pushed down over the oceans it means the land stays much warmer. In situation 1) the land will strongly cool and the ocean will weakly warm with average GASTA cooling. In situation 2) the land will moderately warm and ocean will weakly cool with average GASTA warming. This may be the explanation for the PDO cycles. There really isn’t any change in total energy, it just appears that way because of the differences in the way oceans and land surfaces behave. The wave itself may also be influenced by planetary structures which cause the wave to sync up in specific configurations as we see with the PDO. How does this relate to this paper? Well, we would see more extreme anomalies with the strong cooling over land. However, they would primarily be cold extremes. If this is actually happening then it explains quite a bit but it still wouldn’t explain the millennial cycle that appears to be driving the current warming. How can cold extremes be “warming faster than the Earth’s average”? If cold temperatures are getting warmer, how could they possibly be setting new records. And if they are not setting new records, how could they possibly be considered “extreme”? It would mean that everything between 5% and 95% would have to be cooling. On average. Still trying to get a last big hit before well-deserved obscurity swallows him up….. Since when can an anomaly be warmed? It’s actually unphysical, increase forcing of the climate is directly associated with positive NAO/AO conditions and a more northerly and zonal circulation pattern. Such that the accelerated warming of the Arctic is due to declines in solar forcing since 1995 causing increased negative NAO/AO episodes that are responsible for increased poleward energy transport. That’s a negative feedback with a large overshoot, not amplified polar warming! Ummm…’anomalies are warming faster than the average’. This implies there are areas that are cooling as there is…you know…an average. If everything else was equal and anomalies were warming faster then there would be a warming. As global temperatures stand there hasn’t been. Thus to maintain the non-warming average other areas must be cooling. I wonder why they’re not drawing attention to that? I really think they can’t see it. Few can. It’s like saying the victim was not attacked, he was bashed over the head but his lower body was fine. In fact, the NH cold season shows a cooling trend, even as the NH warm season is still warming.